COOPERSTOWN, NY – The cheerful gnomes of Belgian farmstead Brasserie d ‘Achouffe dropped by the Brewery Ommegang farmstead brewery in the summer of 2010. They brought with them a typically gnomic idea: why not co-create a totally new beer to bridge both farmsteads across the Atlantic Ocean? The beer happily evolved through multiple pilot brews and tastings, resulting in a strong Belgian Golden Ale using Chouffe yeast in the primary fermentation and Ommegang yeast in the secondary. The lushly fruity and spicy yeast is a signature found in every Chouffe beer, and the combination of their yeast, our brewing skills, and our own yeast yielded a unique, flavorful, and aromatic dose of brewing magic. 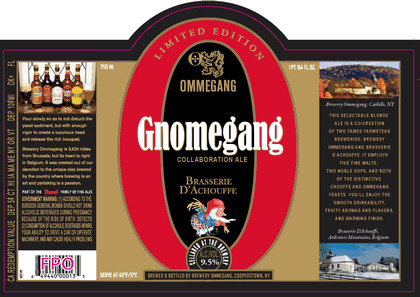 The beer was deemed a big success by Chouffe gnomes and Ommegang alike, was christened Gnomegang, and went into commercial production as a Limited Edition Ommegang ale for sale beginning in the second quarter of 2011. Gnomegang is available in 750ML corked bottles and 1/6 barrels. It is available all across the US, and ships beginning early March for sales beginning late March to early April. A limited number of bottle samples are available for review by e-mail request to larry@ommegang.com.